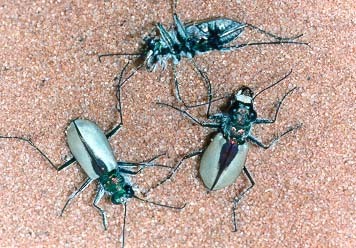 KANAB – In the Coral Pink Sand Dunes near Kanab there lives a beetle, the Coral Pink Sand Dunes Tiger Beetle. Its expanded habitat is being considered for designation by the U.S. Fish and Wildlife Service as critical, and the beetle is being considered for listing as endangered. In October 2012, the FWS proposed approximately 2,276 acres in Kane County for designation as critical habitat, expanding the area covered by a 1997 Conservation Agreement which was amended in 2009. Utah legislators objected to the short time frame for public comment given in the fall of 2012. Their request for additional time to evaluate extensive data and make comment was to no avail and the public comment period closed Dec. 2, 2012. Based on new survey information, the FWS proposal states it has worked with the state of Utah and the Bureau of Land Management to amend the 2009 Conservation Agreement and expand the protected habitats for the species. However, the 2012 Coral Pink Sand Dunes tiger beetle surveys – related to the October 2012 proposal – found beetle adults and larvae in habitat adjacent to the proposed critical habitat area. Therefore, based on this new information, the FWS is now asking that the public review this data and provide input on how the adjacent areas might also be considered for the designation of critical habitat. The public comment period provides for a public meeting and hearing on May 22 and written comments to be submitted by June 5. Coextensive impacts to economic activities are anticipated to be associated primarily with the administrative costs of Section 7 consultations, development of incidental take permits, and consumer surplus losses from anticipated ORV restrictions in the Coral Pink Sand Dunes State Park. The cost of these impacts is estimated to be approximately $225,298 over the next 20 years, at an annualized cost of $13,416. Costs associated with conservation activities that are indirectly attributable to the listing are projected to be $538,44 (see table and detail in the proposed rule linked here). In addition, ORV visitors to BLM land adjacent to the State Park would potentially lose consumer surplus, but these costs are unquantified because of a lack of reliable visitation data. The FWS has reopened the public comment period on its proposed listing and designation concurrent with making available a draft economic analysis, a draft environmental assessment, an amendment to the 2009 Conservation Agreement and Strategy for the Coral Pink Sand Dunes tiger beetle, and an amended required determinations section of the proposal. Survey results are now available that were not available when the proposed rule was written. In its announcement posted yesterday, the FWS stated that it is reopening the comment period to allow all interested parties an opportunity to comment simultaneously on the proposed rule, the associated DEA, the draft EA, the conservation agreement amendment, and the amended required determinations section. A public information meeting and public hearing will be held in Kanab on May 22, 2013, at the Kanab City Library, 374 North Main. Written comments received or postmarked on or before June 5 will be considered. Comments submitted electronically using the Federal eRulemaking Portal must be received by 11:59 p.m. Eastern Time on the closing date. Any comments submitted must reference Docket No. FWS-R6-ES-2012-0053 pertaining to the proposed listing of the Beetle, and Docket No. FWS-R6-ES-2013-0020 pertaining to the proposed designation of critical habitat. Particulars on the proposals and instructions for submitting public comments are detailed on the government regulations website linked here. Stupid stupid stupid. Are you kidding me closing it down for a beetle, this is dumber than closing half of Washington county down for a stupid turtle. If it wasn’t for stupid people, doing stupid things, we wouldn’t have to go to such stupid lengths to protect stupid beetles and stupid turtles. Just one more consequence of over population. I would be nice if we could just get rid of the stupid people, but then the human race would be the endangered.